A face cream with intensive new formula in the fight against wrinkles and fine lines. 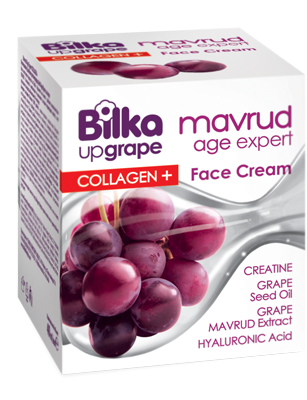 Contains 100% fish collagen and Mavrud grape extract. Enriched with creatine, hyaluronic acid, grape seed oil, shea butter, D-panthenol and allantoin, UVA / UVB filters. Rejuvenates the skin by effectively stimulating its renewal from the inside. It hydrates in depth, improves the elasticity and softness of the skin, protects against photoaging. Does not contains harmful for the human health preservatives and parabens. 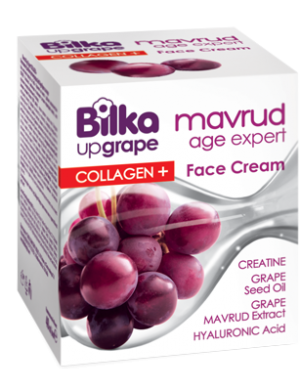 The rejuvenating face cream with collagen and grape extract Bilka Mavrud Age Expert Collagen + is a powerful remedy to fight the signs of aging. Highly effective cream that corrects wrinkles, softens and smooths the skin. The light, intense moisturizing formula keeps the level of collagen in the cells. Improves the elasticity and softness of the skin. Enriched with 100% fish collagen, the cream visibly regains the youthful appearance of the skin, effectively stimulates its renewal and has a fast lifting effect. The UVA / UVB filter protects the skin from photoaging and the harmful effects of the sun rays. Apply on a previously cleansed face with gentle massage movements.